Five more were detained in a raid in Bishkek. Authorities in Bishkek say they killed six terrorists, and detained five more who were planning an attack in the Kyrgyz capital. According to a statement from the State Committee for National Security, the suspected terrorists were members of an international group. On Thursday evening, Kyrgyz special police reportedly entered a private home in southern Bishkek. Authorities say the suspects refused to surrender and opened fire on the police. The operation lasted about an hour and resulted in four of the suspects killed and four police injured. Video from RFE/RL appears to show five men being escorted away from the scene by police in a pair of unmarked vehicles. It is unclear what relation they have to the raid. Reuters reports that two more were killed in another incident which occurred around the same time in the suburbs. Eurasianet reports that gunfire and explosions can be heard in a video recorded nearby. Incidents like this are rare in Kyrgyzstan–or anywhere in Central Asia, for that matter–though governments have increasingly warned that extremists pose a growing threat. Over the past few months a number of men and women have been detained in Kyrgyzstan, suspected of recruiting for ISIS. Kyrgyz authorities have not named the international terrorist group it believes the men killed Thursday were a part of, but local media is reporting that at least two of those killed were Kazakhs and members of ISIS. 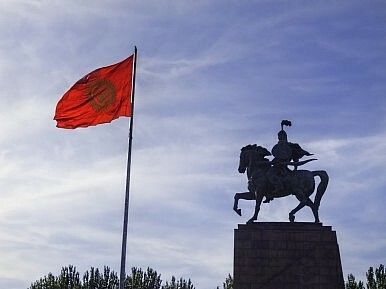 Kyrgyzstan is perhaps the most open of the Central Asian republics–with an active parliament, vibrant media scene, and a large number of civil society and nongovernmental organizations. It is not without troubles however, and over the past year the state has made a number of moves some worry will restrict civil society, as well as religious and personal freedoms. According to RFE/RL, witnesses said they heard shouts of “Allahu Akbar” (Arabic for “God is great”) coming from the scene. Kyrgyzstan is the only Central Asian state to have experienced not just one, but two revolutions, since independence. In neither case was political unrest attributed to Islamic extremists or distinctly co-opted after the fact by such groups—still the Kyrgyz government warns that terrorists are a primary threat. According to the Global Terrorism Database, an open-source database of terrorist attacks around the world, there have been very few recorded incidents in Kyrgyzstan. The most recent entry is a diffused bomb in Balykchy in September 2014. This story has been updated, previous reports only mentioned the incident in central Bishkek. Motivation for those who do join is rooted in social and economic exclusion.